If you are looking for a web development company in Delhi India then you are at the right place. Sevenstar Websolutions is one of the best E-commerce website development company who offers Magento development, WordPress development and other CMS website at affordable price. If you are looking for Website Design India then you are now at the right place. 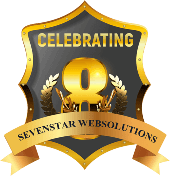 Sevenstar Websolutions is a Website designing agency in Delhi that offers eCommerce website designing, tour and travel website designing, entertainment website designing, corporate website designing and many more at an affordable price. So hire the best web designing company in India at an affordable price. Our experts at Sevenstar Websolutions understand the relationship between the online reputation management and other related services and thus offer you with the most superior solutions to suit your business requirements. We specialize in intensive ORM services which makes certain that you get a great online reputation and brand awareness efficiently and our experts will also help you to build a good reputation so that you are in a place to earn customers’ faith. Sevenstar Websolutions is a Digital Marketing Company based in New Delhi, India offering world class solutions for all your online marketing and technology based needs. We are specialists in Website Designing, Website Development, Search Engine Optimization (SEO), Social Media Optimization, Online Reputation Management, App Development, Video Creation and E-mail Marketing.